Recent surveys indicate that a company’s ability to attract capital at a favourable cost is a direct factor of the standard of the corporate governance employed, and exhibited, by it. There is a growing impetus to improve standards of individual directors and boardroom performance through education, certification and evaluation. The need for good corporate governance and board room practices have never been so pertinent and important in Sri Lanka with increased expectations and responsibilities being placed on directors whilst key stakeholders keenly observe director behaviour and performance as a matter of right. 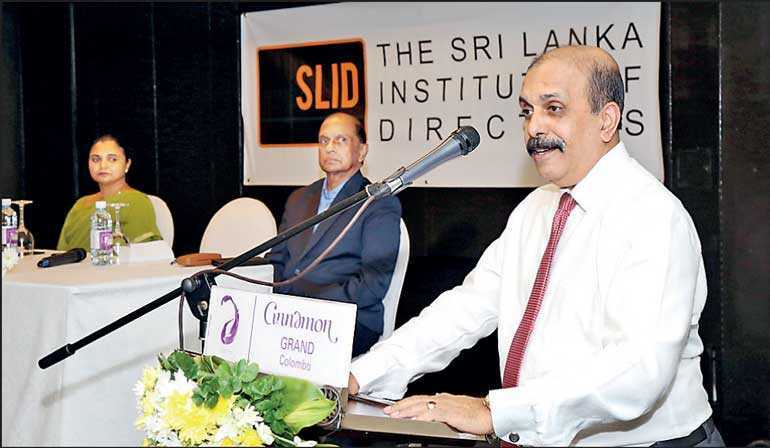 The Sri Lanka Institute of Directors (SLID), the trailblazer on board governance, certified 30 participants from the seventh and eighth intake who completed all four parts of the flagship Board Leadership Director Certification Program (BLT) at a recently held event at the Cinnamon Grand Hotel. Of the 30 certificates awarded, 20 SLID ordinary members are now eligible to use the post nominal GSLID. The names of those who completed will be added onto SLID’s list of potential Independent Directors and shared if they meet the relevant search criteria of companies. This is the only list in Sri Lanka which includes names of people who have completed a director certification program which is accredited by the Securities and Exchange Commission of Sri Lanka (SEC). SLID’s flagship Board Leadership Director Certification Program (BLT) was developed as an international class Training Resource Kit by SLID through material developed by the International Finance Corporation through its Global Corporate Governance Forum. The program is accredited by the SEC and extensively customised by SLID to meet Sri Lankan requirements and aligned to the Company’s Act, the requirements of the Colombo Stock Exchange, the rules and regulations of the SEC and the best practices of the Corporate Governance Code. The BLT program is unique as it includes a combination of facilitated classroom sessions, real-world case discussion and small group exercises that encourage participants to think strategically and drive tangible improvements in performance at an individual, board and organisational level. The SLID faculty comprises of senior directors and knowledge experts, who have the knowledge base, experience and skills to lead director education programs. They enrich the programme by sharing their practical experience and real-life examples which cannot be obtained from textbooks. This is validated by the rating the program has received since its start where over 95% of participants have rated the programme 4 and above (where 1 is the lowest and 5 the highest in the rating scale). Included in the SLID faculty are certified IFC Corporate Governance Board Leadership trainers. SLID Chairman Preethi Jayawardena welcomed the participants and congratulated them on now being equipped to being more effective directors. 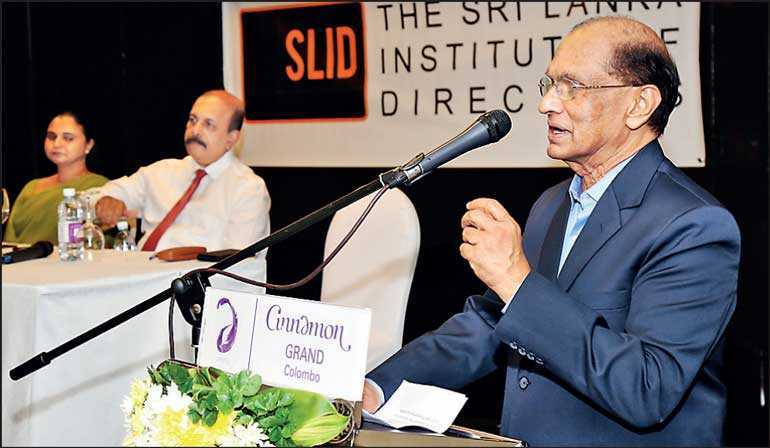 He spoke on SLID’s history and the journey to date whilst sharing SLID’s future plans to continue building better Boards in Sri Lanka. In his introduction of the Chief Guest of the evening, Ronnie Peiris, he stated that Ronnie was the pioneer of this program and was the person instrumental in making it a reality. Peiris spoke on the attributes and behaviours he thinks a director should have. He stated that it is in the practice, and execution, of governance that we tend to fall short. Being a board director is not an easy job. Some people think that it is prestigious for others it is something to do at retirement and for some others it is a way of earning extra money. However, to be a good and effective board director there are some things that you have to do beyond the norm. The first is, commitment. It is not a once a quarter job. It needs time and preparation. To be effective you need to go beyond that. Be prepared to serve your board. Your role is not just for the purpose of sitting on the board. You are the ambassador for the company. If you are not committed it will soon become apparent. The second is to be prepared. However clever or brilliant you think you are there is no substitution for being prepared. It may be fashionable to say “I did it off the cuff” but when you are 100% prepared for the board meeting you will be able to add value to discussions and you will realise that you will be respected by your fellow members and be influential in the final decision. The third attribute is to have equanimity. Equanimity means staying calm and composed in a difficult situation when others around are belligerent and losing their cool. You must also learn to listen. The boardrooms are like kegs of dynamite waiting to blow up. If the board is doing their job there must not be automatic agreement, but there must be constructive debate and discussion. There will be different points of view and you must be able to articulate your point of view in a coherent and calm manner. The fourth is emotional intelligence. He recommended Daniel Goleman’s book on emotional intelligence as it gives you a very good idea what it is. Being aware of emotional intelligence you will not only know yourself better but you will also learn on how to connect with your fellow directors as well as with senior management. The next attribute is to keep an open mind. He referred to a recent presentation he had attended on mind education where the presenter attributes South Korea’s economic success to keeping an open mind. They have been able to increase their per capita income significantly from the lows after the Korean War because they had an open mind, no vested interest or agenda, or pre-conceived ideas. They listened to the ideas of others. If you don’t keep an open mind you can never develop yourself. He went on to say that these were some of the key traits he feels helped him as a board director and encouraged everyone to reflect on the attributes that he discussed today. Going further, he stated that we must learn to be dispassionately passionate. We all have things we firmly believe in but at the board we must not allow this to over shadow the thoughts and opinions of others. We must be passionate on what we are doing but we must be dispassionate to the extent to keeping an open mind and listening to others. He went on to say that passion is a key boardroom success but being able to stay dispassionate is the important ingredient. He wrote a book titled ‘Tough Journey, Great Destination’ as he felt the value system and professionalism in our boards and corporates were eroding by the day. He asked everyone to reflect on whether if we were doing our job in a professional manner would we have allowed for these illegal and unethical behaviour to happen? He advised that we should forget politics and have the confidence in one’s own ability and thereby if someone wants you to do the wrong thing you can decline and if you must, find another job. If that place also wants you to do the wrong thing, then find another job. There must be some place in the corporate world that allows you to do the right thing. Don’t come up with excuses that you have to feed your children; I must earn money, et cetera. If we take that route this country will never change. He went on to say that he thinks it’s time that we all stood up for the right thing. He said he was not talking about politics as he felt that as far as he is concerned everyone in the political world has let him down very badly. We don’t have selfless leaders. As new directors lead the charge, show your professionalism, show it in your selflessness. This has to start at board level and at a leadership level. The most difficult part is everyone is looking for favours. Nepotism is rife. Everything must be on merit. The next attribute is saying no. As a board director you must learn to say no if you believe it is the right answer even if everyone else around you is saying yes. You must make your voice heard. Sri Lankan culture is that we defer to a senior. But in the boardroom, you have the right to voice your opinion. You must not stop yourself from doing this. If you are in the First Eleven, behave that way. There is a provision in the Companies Act that allows for a director’s dissent to be minuted. The final attribute is to be mindful of the context. Don’t look at a decision on a standalone basis but also consider the impact on others. Everything is connected, so any decision you make in the boardroom will have far reaching consequences. Peiris’s encouraging words were followed by the awarding of the certificates by him and Jayawardena. Ananda Atukorala, Dilshan Perera, Shums Cassim, Gihan Perera, U.N. Dissanayake, Indiramli Perera, Nishan Fernando, Pathmanatha Poddiwala, Shanasz Hakeem, Athula Samarasinghe, H.P.J. Hewawasam, Kaneshamoorthy Selvapalan, Tarindra Kaluperuma, Justice K. Sripavan, Harsha Kariyakarawana, K. Thantrige Supeshala, Ranganath Kirindage, Sithambaranathaiyer Vageeswaran, Sanath Manatunge and Dr. Charitha Wijesiriwardana. The following successfully completed all four parts of the program: Chinthaka Dharmasena, Kapila Hettihamu, Chathurika Ekanayake, Vigneswaran Mahathevan, Canisius Fernando, Sisira Senarathne, Janaka Fernando, Dhakshitha Serasundara, Gayan Gunawardana and Theja Silva. Keeping in line with SLID’s view that time is of value the formalities were kept to a minimum with more time for fellowship. The next intake commences in February. For more information about the program contact Nicholas on 2301646.